Inner Space Cavern lay undiscovered by the modern world until 1963 when unsuspecting engineers drilled through 40 feet of rock and into one of the large chambers of the cave. 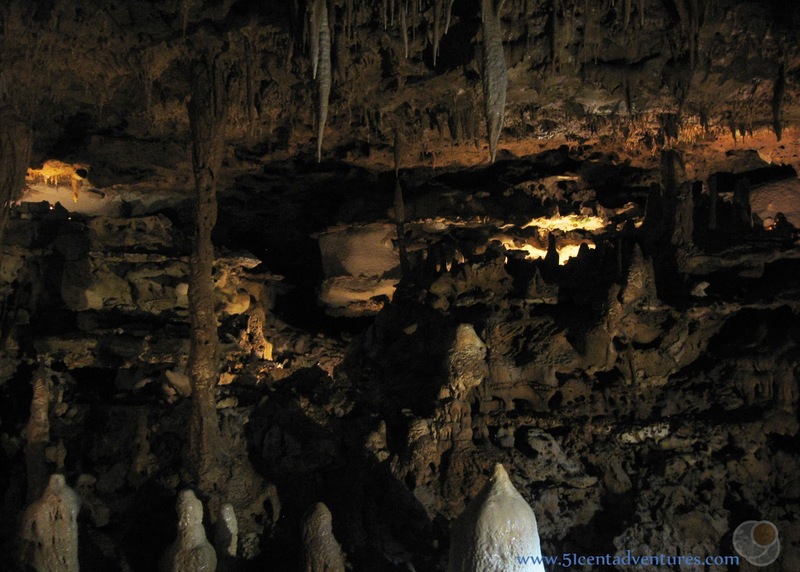 The cave was open to the public in 1966 and since that time thousands of people have been able to see the fascinating world created from limestone. A tour of the cave is like a trip into another world. Location: 4200 South. 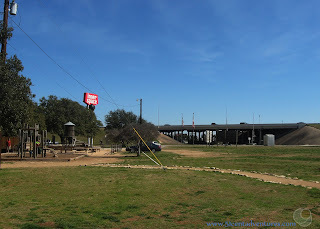 I-35 Frontage Road Georgetown, Texas. Georgetown is about 25 miles north of Austin. Cost: Tours start at $19.95 for adults and $11.95 for children. Tickets are sold on a first come first serve basis. Operating Seasons and Hours: Open from 9:00 to 4:00 Monday through Friday and 10:00 to 5:00 on Saturday and Sunday. Occasionally closed for major holidays such as Easter and Christmas. My family moved to Fort Hood, Texas in January of 2013. Within a few months of moving to Texas my husband's Amry unit received block leave time, and we were able to go on a little vacation. Since we'd just arrived in Texas we wanted to explore our new state. 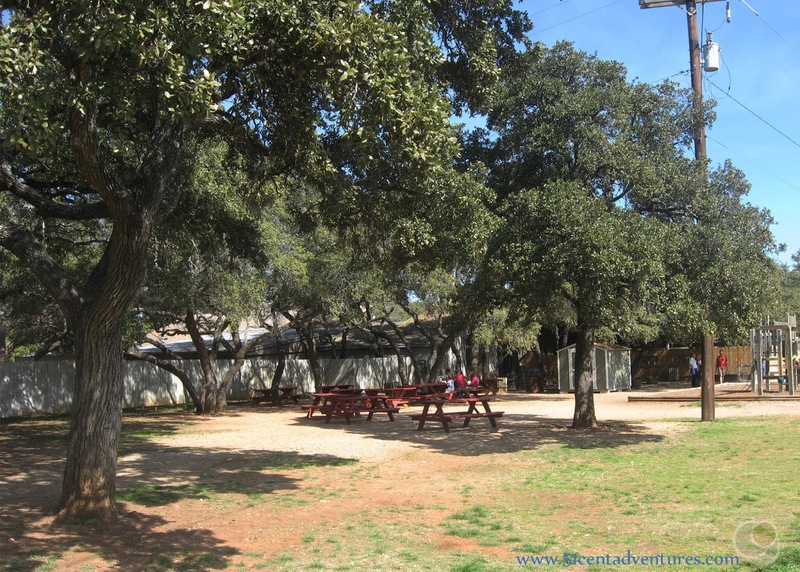 That initial Texas road-trip involved memorable destinations such as the Houston Zoo, the San Antinio Riverwalk, and Aquarena Springs. However, there was one thing that we couldn't do on that road trip and that was to go inside a cave. But not for lack of caves to see. I found at least five in the vicinity of our travels. Instead it was our 11 month old son that put the kibosh on any cave visiting. He couldn't walk yet, but he weighed around 25 pounds. The caves either didn't allow babies in packs at all or only allowed them in front packs. Neither my husband nor I wanted to pay $19 to carry our heavy son around for 90 minutes while keeping two twins (who also weighed around 25 lbs) happy. So going on a cave tour got shelved until all our kids could walk. Fast forward almost two years to 2015. 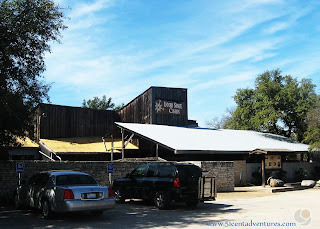 Going on a cave tour hadn't been feasible during the last two years. We'd added another baby to our family, and my husband had spent 9 months in Korea. 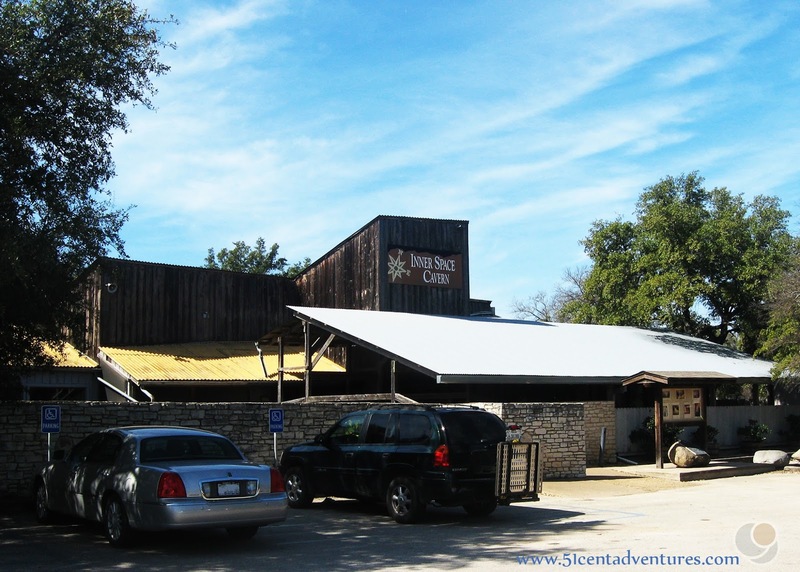 We were getting ready to move to Fort Rucker, Alabama and I was feeling kind of sad that we still hadn't been able to visit any Texas Caves. So when my sister offered to watch all four of my kids overnight so that my husband and I could have a chance to get away for Valentines Day, I knew exactly what I wanted to do. We stayed overnight in a hotel in the north part of Austin. On Saturday morning we drove the 20 miles to Georgetown to take a tour of Inner Space Cavern. I picked this cave for two reasons. 1. It was the closest cave to our home in case we had to hurry back home to rescue my sister. and 2. It actually has some pretty cool history. The cave was only discovered in 1963 when the Texas Highway Department was planning the route of what would become Interstate 35. Engineers were taking core samples to make sure the ground could support the heavy interstate. Imagine their surprise when the drill punched through to an open space after only 40 feet down. 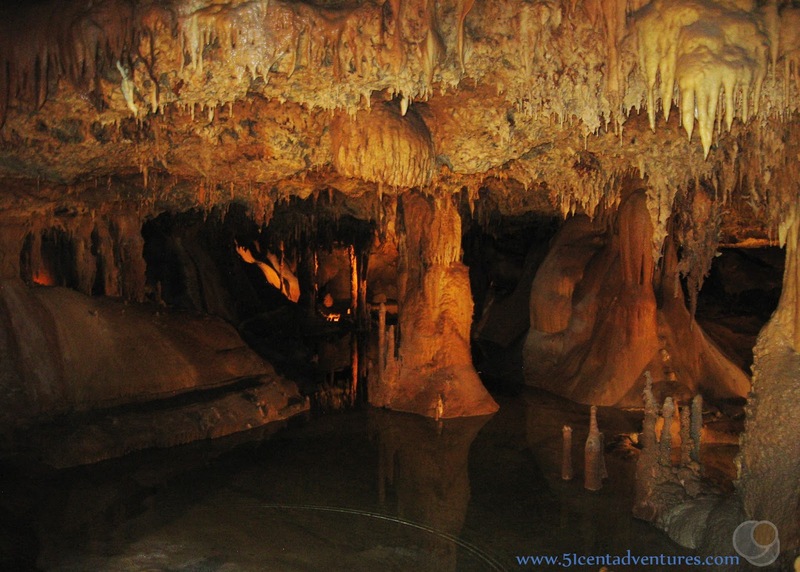 Three years later the cave was opened to the public as Inner Space Caverns. 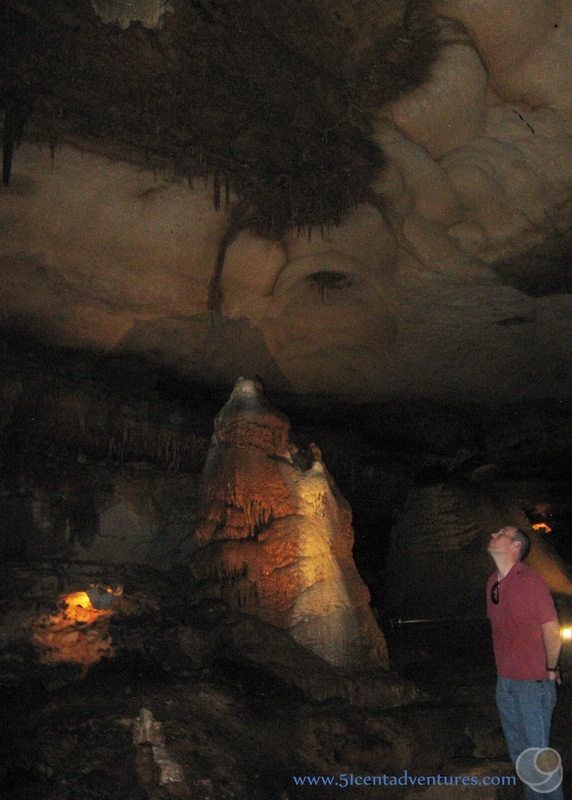 Tours are offered daily so people can get an upclose look at this relatively undisturbed cave. Interstate 35 route didn't change too much with the discovery of the cave. The enginers determined that the 30+ feet of limestone over the top of the cave was strong enough to support the interstate The cave entrance is within a few hundred feet of the interstate, and parts of the cave actually go under the interstate. There is a nice little visitor center built over the cave entrance. We went in there and purchased our cave tour tickets. In prehistoric times there were other entrances to the cave. Most of these were similar to sink holes where the top of the cave fell in. Animals were able to enter the cave and many of their bones have been found. These bones included ones from Mammoths. 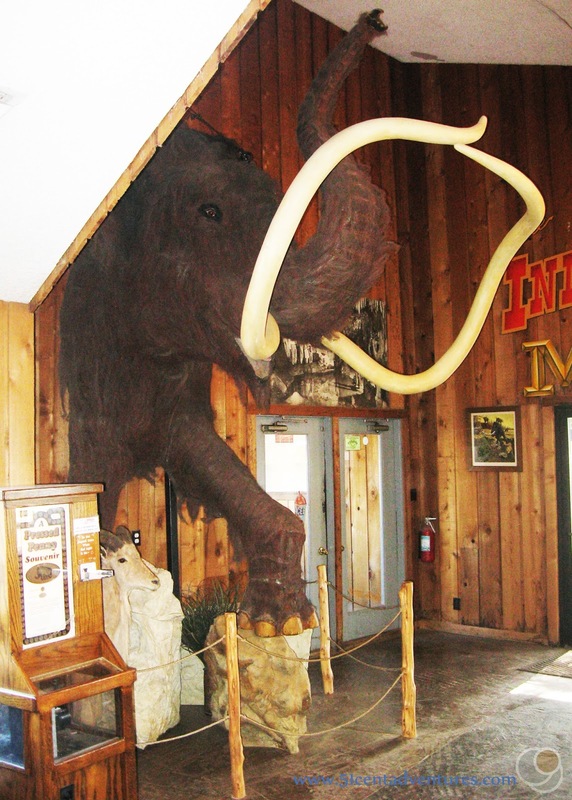 This partial statue is on display in the visitor center to remind visitors that these creatures once walked here. After waiting for a few minutes our cave tour was annouced and we met up with our group. Then it was time to enter the cave. 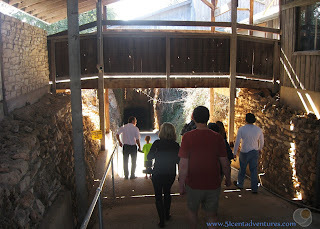 We walked down a wide ramp into the man-made mouth of the cave. The cave has many networks of tunnels. 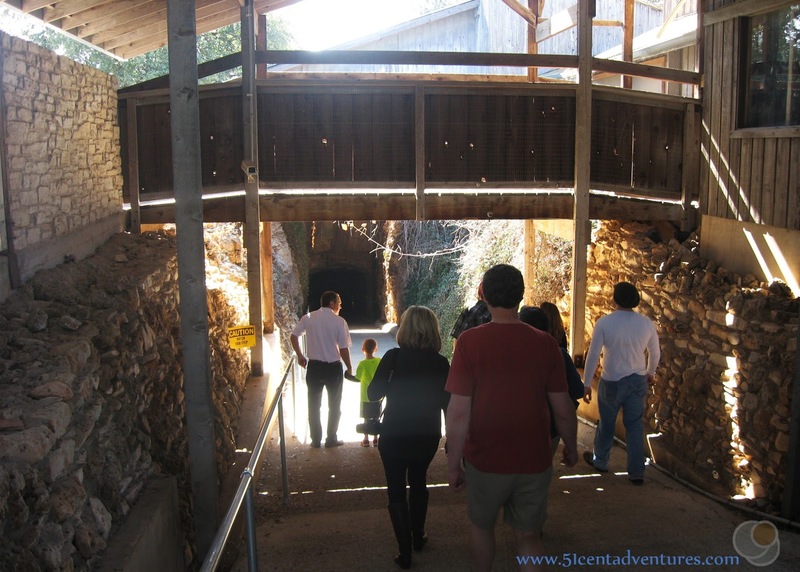 There are three cave tours that will take you to various parts of the cave and involve various levels of difficulty. We'd picked the Adventure Tour because it was the least expensive. It lasted 1 hour and 15 minutes and took us to many interesting parts of the cave. One of our first stops was a large cavern with a circular hold in the ceiling. This is where the drill punched through back in 1963. 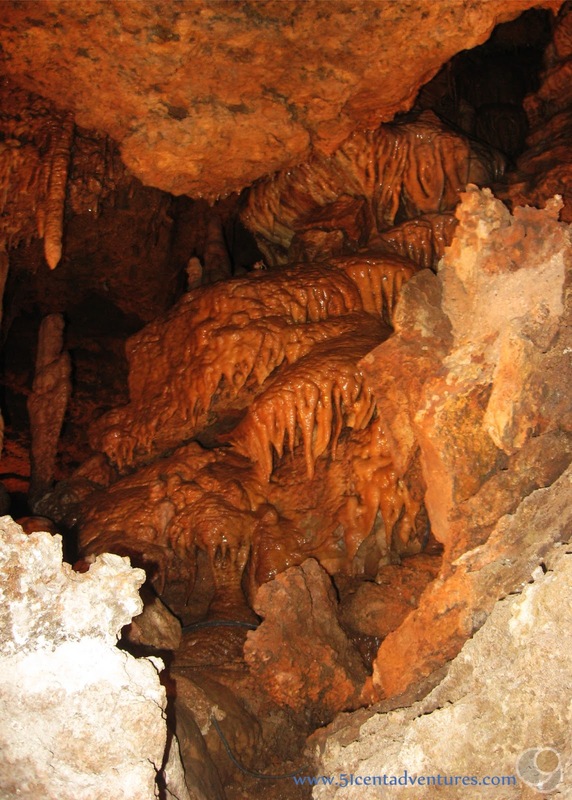 The cave was full of beautiful stalagmites and stalactites. Since this cave was discovered relatively recently none of the structures had been vandalized by tourists of long ago. 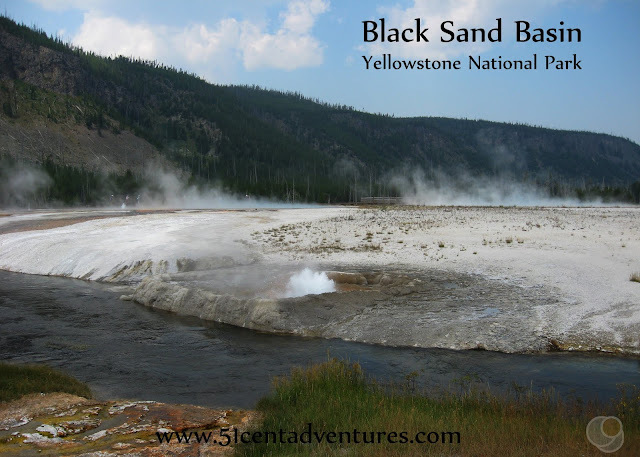 Many beautiful formations had been created by water flowing through the limestone over time. A section of the cave has a cement retaining wall. (I can't remember if this is part of the interstate foundation or if it was just blocking off an unstable section of the cave.) 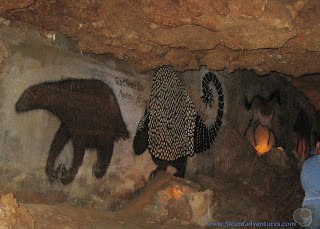 Artists decorated the wall with pictures of the prehistoric animals that had been found in the cave. Many of them happen to be from the cast of the movie Ice Age. My favorite section of the cave was toward the end of the tour. 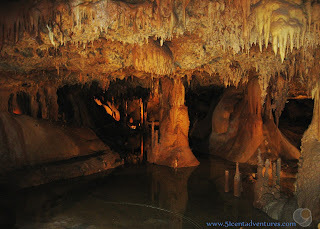 There was a pool of water that was only disturbed by water dripping from the stalactites. As with every cave, we weren't allowed to touch any of the features. (The oils in our hands would plug up the pores that allow water to flow through the limestone.) However, there was one section fo the wall that we could touch. Here I am touching that part of the cave. The tour doubled back the way we came and soon we were heading back up the sloping tunnel to the entrance. It was kind of weird to stand on the surface and realize that a whole other world was under our feet. I really enjoyed the cave tour of Inner Space Cavern. I'm also glad that we didn't try to do it with the kids. The cave wouldn't have been as enjoyable if I'd had to carry one of my heavy babies for 75 minutes. As it turned out we didn't take our kids on a cave tour until January of 2016. By that time our youngest was 2 and able to walk long distances on her own. 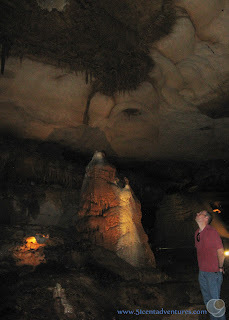 We went to Florida Caverns in Marianna, Florida. 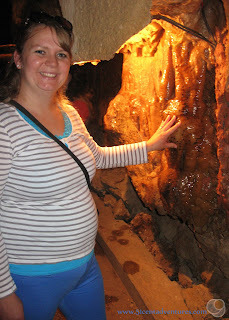 That tour went so well that in April we went to see the underground waterfall, Ruby Falls, in Chattanoga, Tennessee. And then in October we went to Mammoth Cave in Kentucky. One day I'd love to make it back to Texas and explore more of the caves there. Recommendation: Inner Space Cavern is a beautiful cave and worth your time and money. The fact that it wasn't discovered until the 1960's means that it has been well preserved. There are many fascinating features for you to discover inside the cave. Directions: Thanks to it's location right next to the interstate, Inner Space Cavern is super easy to find. Just take exit 259 off of Interstate 35. The entrance is on the west side of the interstate. And if all else fails, just look for the large "Inner Space Cavern" sign above the building. 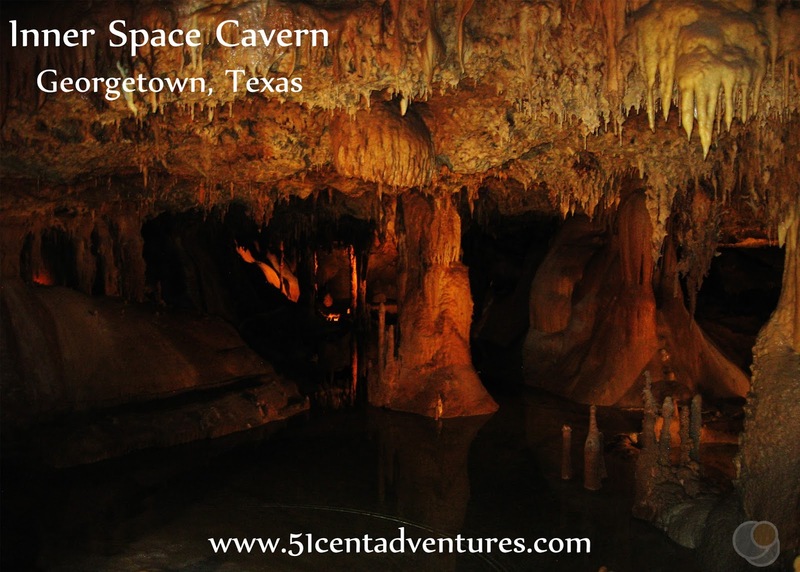 Places Nearby: Inner Space Cavern isn't the only cave in Central Texas. The topography of the area is perfect for cave formation. Unfortunately I wasn't able to visit any of the other caves, but here are links to some of them in case you want to visit them. Natural Bridge Caverns, Sonora Caverns, Cave Without a Name, Longhorn Cavern State Park, and Fault Line Cave.